We are very excited to announce our own VFG bookshops, on Amazon! They are full of recommended reading for vintage fashion education. If you've ever thought you needed some vintage fashion books but didn't know where to start, here is your reading list. With our international users in mind, we've opened similar shops on both USA based amazon.com, and UK based amazon.co.uk. We've spent time compiling an amazing book list and put them together in one place, where they are still supplied and delivered by Amazon or Amazon sellers. We have titles by our own VFG members, and other books that have been recommended by our trade members and forum users. There are some rare and unusual titles that you might not otherwise hear about. There's even a fiction section with novels featuring vintage fashion for your leisure reading! Special thanks are due to former VFG member Lei Marvin of Corsets & Crinolines (crinolinegirl) for her work in compiling the original booklist that was a starting point for the shops' contents. To help you browse, there are different 'shelves' such as: Victorian and Edwardian Fashion; 20th Century Fashion; Fabric and Sewing; Hats Shoes and Accessories; Jewelry; Lingerie and many more. It's not only books - we've also included a selection of useful cleaning products for your vintage wardrobe, and some handy things for sellers. As well as being an educational resource, the bookshops are a VFG fundraising initiative. The VFG is a member of the Amazon Associates programme, and earns a small commission on all products sold, at no extra cost to you or the authors. Funds raised are used to support the work of the Vintage Fashion Guild, including maintaining and developing our website and its free resources. So by shopping in our bookshops you can support the VFG, as you develop your book collection. Click the buttons above or the links below and have a look around the shops. Which books do you like the look of? We'd love to hear your wishlist! Small print legal announcement as required by Amazon and the FTC! "The Vintage Fashion Guild is a participant in the Amazon Services LLC Associates Program, an affiliate advertising program designed to provide a means for sites to earn advertising fees by advertising and linking to amazon.com." But we'd already said that above, in plain English. denisebrain and sarah-jane like this. this is so exciting, thank you SO MUCH for bringing this to life, Ruth!! LOVE this!! Divadezines and Retro Ruth like this. Very very cool and such a good way for both readers and the VFG to benefit! Wow, this is very cool! 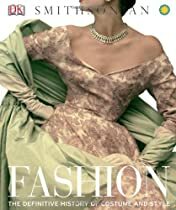 If you are taking recommendations for books to add, I would suggest Fashion: The Definitive History of Costume and Style which was put out by the Smithsonian last year. Thanks Jodie! I'm planning to start a separate thread at some point for book recommendations, but by all means post them here too. I will certain add that one, thanks for the link. And no sooner said than done - this really does look like a fabulous book! That's exactly my thinking Melanie. Congratulations!!! I know the books that I have on vintage are constantly referenced. Also, these will make great gifts for any vintage-conscious gal or guy you know. Yes indeed, I'd be happy to get any book in this shop as a gift! I'm so glad to be at this grand opening of the new VFG Bookshops. You've done an amazing amount of work Ruth! Thank you! The Vintage Merchant and Leonardo Da Vintage like this. I couldn't resist and trotted to the bookstore to buy Melody's book which was on my wish list. That's great Claire - I think you are our first customer! I cant let myself be tempted this week, I have to be strong! Aw share your wishlist with us anyway Gayle! Ruth you are being a temptress!! Okay I'll start. I'm holding myself back from the Bakelite Jewelry Book by Corinne Davidov. And the Ettinger handbag book. I cracked, but I guess there's no harming in looking! I would love to buy these to start with!